Blood Support incorporates the most powerful blood cleansing herbs known to man. 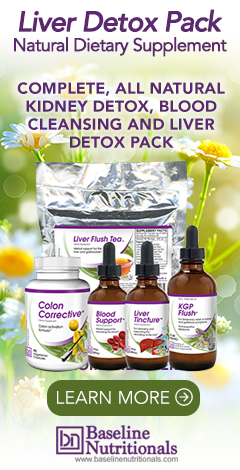 Burdock root, goldenseal root and bloodroot work to help remove toxic residues that naturally form in the blood, thus promoting optimum liver health, while at the same time supporting your blood’s natural protective properties. The blood detox helps the body's ability to support normal cellular growth. It is a powerful blood purifier and lymph cleanser, cleanses the bloodstream, and supports the circulatory system. Take 4 droppers (4mL) of the Blood Support™ in 1-2 oz of juice. Shake well before using. Repeat 3 times a day until bottle is finished (if you miss a dose, keep taking until the bottle is finished). To get past the taste (very bitter, very hot), Jon recommends adding the Blood Support™ to 2 oz of thin, sweet undiluted juice such as apple or grape, downing it in one gulp like a shot of liquor, and then swishing some plain juice in your mouth to clear the taste. (By the way, although normally not a fan of bottled juices, this is one place where they actually work because they are so convenient and because you drink so little at a time.) Thick juices such as peach or orange, on the other hand, tend to coat the mouth, which makes the taste linger -- not good. And diluting it simply means you have to drink more, rather than getting it all down in one quick gulp, so stick to the 1-2 oz of juice. I have melanoma lung cancer. I have had a cancer removed from my brain and they said I had seven melanomas in my lungs. I am taking blood support and feeling much better. I plan to take two weeks break and then continue the treatment as before. My question is: Do I keep taking blood support for three weeks and break for two weeks until I get a good MRI report, or should I stop completely after say 3 months? Thank you for sharing and we sincerely hope you feel better. For obvious legal reasons, we can not prescribe or diagnose. Although Baseline Nutritionals also can not legally answer any medical question, you can direct any product questions to their customer support team by emailing [email protected]tionals.com. This is one of the best detox plans I have come across. I have spent years chasing my symptoms and researching what has worked for others. Clearly Rx meds are not the answer, They always did me more harm in the long run. There is no single magic bullet. It’s not just important to deal with Colonic cleansing, the bowel, or supplements. This detox plan covers the big picture. The only thing I would add is that we have to eliminate the source of the problem. In my case it was breast implants (Biofilm and toxins), and amalgam tooth fillings (heavy metals). Any foreign objects in the body cause dangerous Biofilm. Rx meds such as antibiotics destroyed my natural flora, and we’re fuel to a fungal fire. Mold in the home is an issue for many. The cortisone meds that followed antibiotics almost destroyed my immune system. Root canals can also become septic head quarters. Eliminating the source of toxins, followed by this type of thorough detox plan, will bring us back to health! Thank you. u mentioned 9 detoxes, listed only five ( combined some of them ) and where is the pancreatic detox ? do u sell the pancreatic detox products ?